The translators in our world who bring us translated literature are crucial to our understanding of word and art across all cultures and borders. Meet the translators behind prize-winning translations. 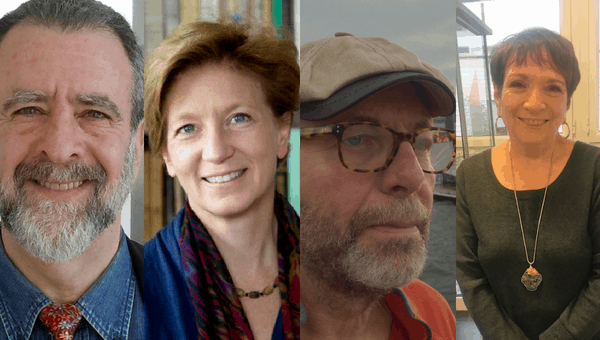 Sponsored by PEN America’s Translation Committee and moderated by Committee member Jonathan Cohen, this program showcases three translators talking about translation and reading from their works. We will hear from Pierre Joris, 2005 Poetry in Translation Award winner for Lightduress (Paul Celan); Tess Lewis, 2017 PEN Translation Prize winner for her translation from German of Angel of Oblivion (Maja Haderlap); and Sandra Smith, 2007 PEN Translation Prize winner for Suite Française (Irène Némirovsky). Listen to these translators perform as writers and make the foreign familiar. Join us on September 11 for Not Invisible Today: Winners of PEN Translation Prizes. Jonathan Cohen is a poet, translator, essayist, and scholar of inter-American literature. Winner of the Robert Payne Award of the Translation Center at Columbia University, he has translated the work of Latin American poets Ernesto Cardenal (Pluriverse: New and Selected Poems, New Directions), Enrique Lihn (The Dark Room and Other Poems, New Directions), Roque Dalton (Small Hours of the Night, Curbstone Press), and Pedro Mir (Countersong to Walt Whitman and Other Poems, Peepal Tree Press). He is the author of A Pan-American Life (University of Wisconsin Press), the only biography of Muna Lee, the premier translator of Latin American poetry in the early twentieth century. He is editor of William Carlos Williams’s By Word of Mouth: Poems from the Spanish, 1916–1959, and the “Centennial Edition” of Williams’s Al Que Quiere!—both published by New Directions. His edition of Williams’s translation of the Spanish Golden Age novella, The Dog and the Fever, by Pedro Espinosa, was just published by Wesleyan University Press. He earned an MFA in creative writing (poetry and translation) from Columbia University, and a PhD in English from Stony Brook University; his dissertation, titled “Neruda in English: A Critical History of the Verse Translations and Their Impact on American Poetry,” won Stony Brook’s first Herbert Weisinger Prize “for most promising dissertation within all disciplines university-wide.” He has been an active member of PEN America’s Translation Committee since 1986. For more information, visit jonathancohenweb.com. Sandra Smith was born and raised in New York City. She currently lives in the New York area and teaches at NYU and has given Master Classes at Sarah Lawrence and Columbia. Sandra Smith is the translator of all 12 novels by Irène Némirovsky available in English, as well as a new translation of Camus’ “L’Etranger” (“The Outsider”, Penguin UK, 2012). Her translation of Némirovsky’s “Suite Française” (2006) won the French-American Foundation and Florence Gould Foundation Translation Prize for fiction, as well as the PEN Book-of-the-Month Club Translation Prize, the first time that the same book has ever won both prizes in the same year. “Suite Française: also won the Independent British Booksellers Book of the Year prize and was voted Book of the Year by The Times of London. Six of Smith’s translations have been adapted as radio plays on the BBC and the movie of “Suite Française” was released in 2015. Her translation of a biography of Jacques Schiffrin will be published by Columbia University Press early in 2019. Pierre Joris, while raised in Luxembourg, has moved between Europe, the US & North Africa for over half a century now, publishing more than 50 books of poetry, essays, translations & anthologies — most recently a translation of Egyptian poet Safaa Fathy’s Revolution Goes Through Walls (SplitLevel, 2018), The Book of U /Le livre des cormorans (poems; with Nicole Peyrafitte, 2017); The Agony of I.B. (a play commissioned & produced in June 2016 by the Théatre National du Luxembourg; Editions PHI); An American Suite (early poems; inpatient press 2016); Barzakh: Poems 2000-2012 (Black Widow Press 2014); Breathturn into Timestead: The Collected Later Poetry of Paul Celan (FSG 2014); A Voice full of Cities: The Collected Essays of Robert Kelly (co-edited with Peter Cockelbergh; 2014, Contra Mundum Press) & The University of California Book of North African Literature (volume 4 in the Poems for the Millennium series, coedited with Habib Tengour, 2012). Forthcoming are the two final volumes of his Paul Celan translations, Microliths (Posthumous prose) from attem-verlag (2018) & The Collected Earlier Poetry (FSG 2020), as well as a volume of essays, Against Tyranny, & a Pierre Joris Reader (BWP, 2020). When not on the road, he lives in Bay Ridge, Brooklyn, with his wife, multimedia praticienne Nicole Peyrafitte. He received the 2005 Poetry in Translation Award winner for Lightduress (Paul Celan). Breathturn into Timestead: The Collected Later Poetry of Paul Celan (FSG 2014) was shortlisted in 2014 for the PEN Poetry in Translation Award, which received the 2015 ALTA (American Literary Translators Association) National Translation Award in Poetry. In 2013 the MLA Aldo & Jeanne Scaglione Prize for a Translation of a Scholarly Study of Literature was awarded to The Meridian: Final Version—Drafts—Materials by Paul Celan, edited by Bernhardt Böschenstein and Heino Schmull, translated & with a preface by Pierre Joris. Stanford University Press, 2011.